Location: Cloghy, County Down, Northern Ireland. Ownership / Access: Northern Ireland Environment Agency. Notes: Kirkistown Castle is a castle situated near Cloghy, County Down, Northern Ireland. 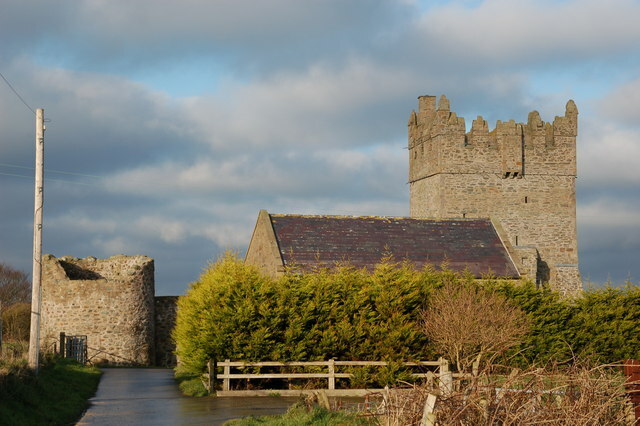 The tower house and bawn is a state care historic monument in the townland of Kirkistown, in Borough of Ards, at grid ref: J6450 5800. It is an impressive three-storey tower house, built in 1622 by Roland Savage, a Norman landlord, at the site of a ninth-century round tower. It was occupied until 1731, when it was deserted. It post-dates the Plantation, but is fully in the late medieval tower-house tradition. Parts of the bawn wall survive with three-quarter round flanker towers at the angles. The tower was remodelled in Gothic style in 1800 by a Col. Johnston, and in 1836 some further work was performed by a very young Master Montgomery of Grey Abbey. The building was left, however, with a partial roof and broken windows, and the elements soon returned it to disrepair. The Northern Ireland Environment Agency opened it to the public for the first time in 2001.